In the course of human history and evolution, which came or should come first: chicken-or-egg-like job-demand or job-supply? On the assumption that there is any correct and demonstrable answer—in particular cases, if not also in all, it can give your thinking about recruiting a shake, akin to the jolt biology got about 50 years ago, once it was understood that the egg had to come first [explained below]. That result established that a chicken is just an egg’s way of getting more eggs and that we are just DNA’s way of getting more DNA. Does It Matter Which Came or Comes First? Are employment dynamics actually and importantly also affected by which came or comes first? If and when this is so, strategically and tactically, which should come first—employer job supply or candidate job demand, to ensure maximum advantage and gains? Historically speaking, answers to “which came/comes first?” questions have been demonstrated to have profound effects on our understanding and strategies. It Was the Egg, of Course! The solution of the timeless riddle of the chicken or the egg perfectly illustrates how knowing which came first allows us to explain, predict and design a lot, as a segue to the question of the primacy of job demand or job supply. The reason[ing] is that chicken DNA is an absolute prerequisite for getting a chicken. By contrast, a chicken could not have been necessary or possible in order to get the first chicken DNA, because the ancestor of the first chicken—by definition not a chicken—could, given natural selection, have created that chicken only through a random mutation in its genes, transmitted at the moment of egg creation. The ancestor of the first chicken egg, however, could have been—indeed, had to be—any one of a number of other creatures, including birds or even a reptile [widely regarded as the or a progenitor of birds]. 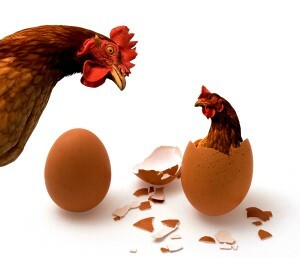 Hence, the chicken egg had to come first, as both the precursor and “manager” of the chicken. [The reason that the chicken-egg riddle seemed so daunting for so long is that the solution required and had to await the discovery of DNA and acceptance of the principles of natural selection—or at least an equally clear mechanism of heredity. Accordingly, the controlling fact in the life of a chicken or a human is that genes have for millions of years “manipulated” us more than we’ve manipulated them. This paradigm shift, for example, explains how manipulative genes can be lethal to the body that carries them, yet still successfully propagate themselves. It has been argued that in Huntington’s chorea, a deadly brain disease that ends the life of its carrier at around the age of 25, the gene apparently offsets the shorter life span of a male human host by predisposing him to becoming more promiscuous and therefore likely to create and leave more copies of that lethal gene in the shorter reproductive time available. Knowing that this behavior can at least be influenced by that gene can guide our strategies for controlling and monitoring the course of individual cases and persistence of the disease in the human genome. Now, imagine that, like the egg, job-demand anthropologically and historically must have come first. For example, imagine that a demand for the skills of somebody in the cave foolish, brave or hungry enough to stealthily to try to steal T-Rex eggs had to precede a supply of such dinosaur-egg rustlers. Not only does this illustrate how employer-side job demand—in the sense of demand for someone to do a job—could have come first; it also suggests that the first jobs were more like commission-based work, rather than straight salary. That’s because whoever volunteered or otherwise offered to take on the job of egg-snatcher probably got to share in the spoils by skimming off something for himself or herself, unless [s]he was a captive slave. On the other hand, as a rival account, there’s the Field of Dreams, the Kevin Costner “build it and they will come” school of market dynamics. If you are not familiar with it, that movie’s most memorable line was uttered as encouragement to build a baseball diamond to entice ghosts of long-dead baseball greats to assemble and play a game in a corn field. On the Field of Dreams’ theory, supply creates demand, much as a passing ice cream truck does on a sweltering suburban summer’s day or a foxy job seeker does for a movie producer who didn’t need an assistant, until she applied. Likewise, the “world’s oldest profession”, among descendants of Neanderthals, if not among the Neanderthals themselves, may have been established on the supply side first. But, such supply-driven ice-cream and secretary cases aside, the general demand-driven model of human behavior still seems compelling, at least as a rival model of prime movers: First comes desire [demand], then comes action to satisfy it [supply behavior]. What is called “Keynes Law” essentially states the same thing: Demand creates its own supply. Whichever came or comes first, why does it matter? One reason is that, at least in some instances, the one that “shows its hand” first has a disadvantage—because of revealed needs, desires and eagerness. An “I need a job—any job!” ad or sign on your truck can indeed get you a job, but at the price of potentially much lower negotiated pay than if those doing the hiring came looking for you. Ditto for “Must Sell Now!” ads. That inherent disadvantage or risk, in a “first-strike” strategy—i.e., of being the first to make a move in a job market—seems to apply more generally in any supply and demand situation: Offering anything as supply before there is demand for it is likely to fetch a lower price than the reverse will, i.e., meeting a pre-existing demand. Of course, if this reasoning—that demand must precede supply to maximize supply-side gains—universally prevailed, nothing would be offered as supply without pre-existing demand—no jobs, no ice cream, no iPhones, nothing. 1. Simultaneous promotion and marketing creates demand: This is the underpinning of modern advertising and PR. When, in 1929, PR and propaganda whiz Edward Bernays, nephew of Sigmund Freud, embarked on selling cigarettes for tobacco-company giants, he glamorized women’s smoking in public by strategically positioning a parade of debutante suffragettes puffing away in front of media cameras he invited. Thereby he created demand, want and “needs” through a Pavlovian, partly unconcious association of a woman’s new-found “freedom to vote”, women’s liberation and defense of democracy with “freedom to smoke” through the slogan “Torches of Freedom”. Bernays’ lesson for recruiters here is that you don’t have to worry about negotiating handicaps in “first-strike” offers of jobs, if you follow the common practice of simultaneously or previously creating or confirming a demand for your jobs. The recruiter most at risk in a job supply-without-proven-demand scenario is one hiring for an unproven, unrecognized company or in an altogether new sector with a shortage of skilled candidates—or a shortage of imagination among them. 2. Supply can trigger latent demand: Like an ice cream truck driver, a recruiter can trigger latent or dormant demand merely by making a job enticing enough and by ringing the right bells at the right time and place. If market research indicates a lack of active, yet potentially reawakened interest in job X, the recruiting industry or individual/sector employers can consider triggering demand for X by analyzing and addressing the factors underlying the latency of interest. For example, if, like an attractive ice cream truck, the hiring seller goes to the job buyer, as is the case in on-campus recruiting, otherwise dormant interest in the job can be awakened. This means finding something comparable to the bell and song of an ice cream truck, on-campus recruiting or, more generally, Bernay’s techniques to trigger a kind of positive Pavlovian response, through candidates’ association of it with prior experience, understanding and skill set. 3. Large volume can offset negotiated first-strike supply losses: In economics, the familiar revenue formula R=P x Q, i.e., Revenue = Price/unit x Quantity of units sold, suggests that negotiating a lower price or fee for anything can still result in gains higher than sticking to a higher price would, if the volume—the quantity—moved is high enough to more than compensate for the lower price. In hiring terms, this means that any wage or salary negotiation disadvantage in a first-strike supply strategy, namely, the negotiation risks of offering jobs before demand for them is proven, can be offset if the productivity and efficiency of hiring large numbers of employees on that basis generates profits large enough to compensate for the higher pay those workers can command in virtue of their negotiation leverage. whether the question and answer matter as much as the analogous chicken-and-egg riddle and solution has in genetics? As for which came first, there is no logically or evidentially compelling answer. It may have been either a case of a first-strike, first-mover demand for talent or first-strike, first-mover supply of it, since some anthropoid ancestor may have, in the midst of showing off speed, stealth and agility, triggered the idea in horde-mates of using that talent to steal Tyrannosaurus eggs. That is, initial supply of primeval talent may have triggered demand for it. Regarding the second question, even if “which came first” did have a single definitive answer, that answer would not constrain all subsequent hiring dynamics and evolution the way the egg-first answer has constrained and influenced biological evolution. 1. Business practices are not hereditary. 2. Any individual decision to start with job supply [or with job demand] first will not inflexibly determine or influence any other subsequent or independent individual decision about which to start with. 3. Logic supports both models and approaches on a case-by-case basis and in light of possible compensations, such as high volume mentioned above, that can offset the costs associated with “showing one’s hand”, appearing too eager or presenting one’s offer in a context with unknown demand or supply. To these considerations, I would add one qualification: In deciding which should come first, your next job-supply or job-demand decision, there is a third thing that should precede both.